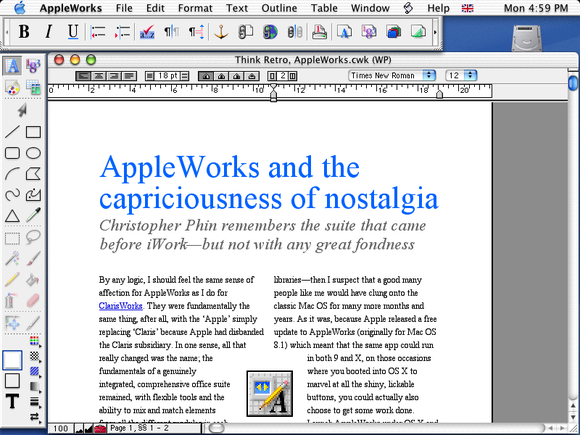 Christopher Phin remembers the suite that came before iWork, but not with any great fondness. 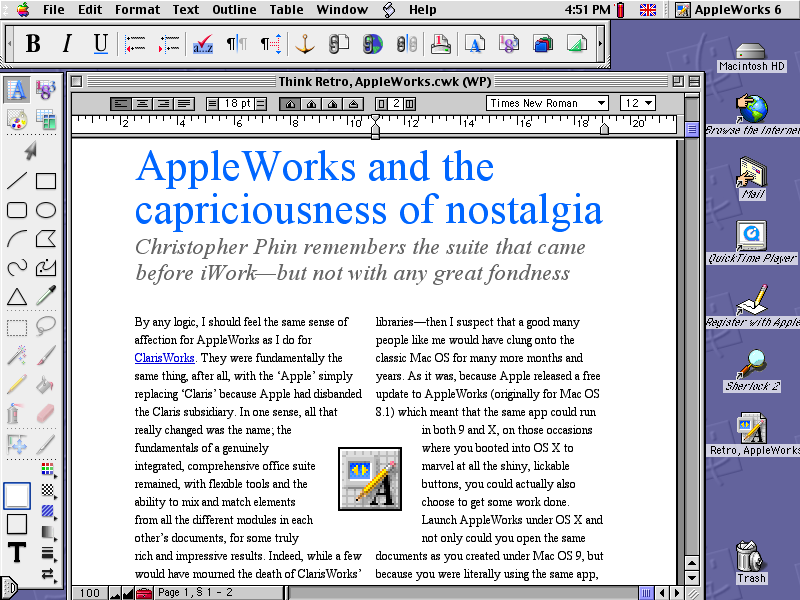 By any logic, I should feel the same sense of affection for AppleWorks as I do for ClarisWorks. They were fundamentally the same thing, after all, with the ‘Apple’ simply replacing ‘Claris’ because Apple had disbanded the Claris subsidiary. In one sense, all that really changed was the name. The fundamentals of a genuinely integrated, comprehensive office suite remained, with flexible tools and the ability to mix and match elements from all the different modules in each other’s documents, for some truly rich and impressive results. Indeed, while a few would have mourned the death of ClarisWorks’ communications module, far more would have welcomed the introduction of a presentation module in AppleWorks. 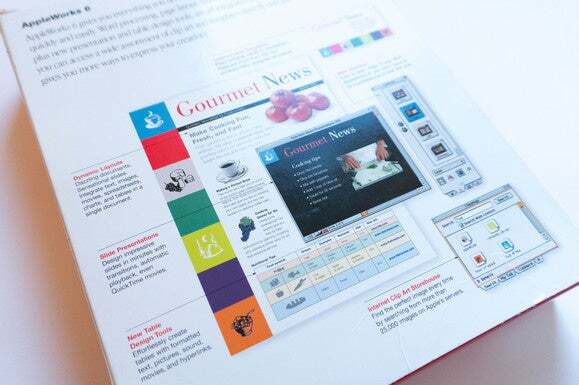 While it would scarcely have kept PowerPoint’s product manager awake nights, AppleWorks was just as capable of creating soporific slide decks of regional sales figures as Microsoft’s behemoth. 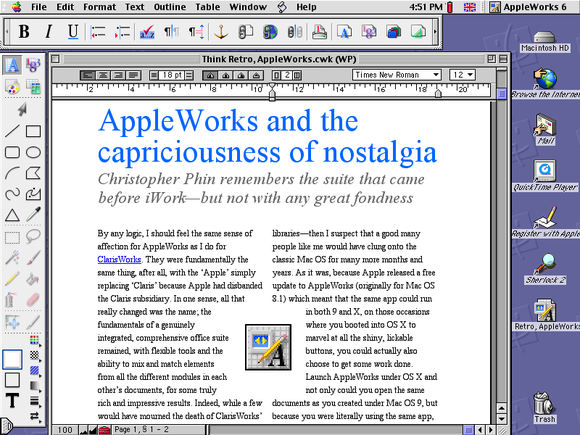 And if it wasn’t for AppleWorks smoothing the way between Mac OS 9 and Mac OS X—as a high-profile example of an app that could run on both thanks to Apple’s Carbon libraries—then I suspect that a good many people like me would have clung onto the classic Mac OS for many more months and years. As it was, because Apple released a free update to AppleWorks (originally for Mac OS 8.1) which meant that the same app could run in both 9 and X, on those occasions where you booted into OS X to marvel at all the shiny, lickable buttons, you could actually also choose to get some work done. 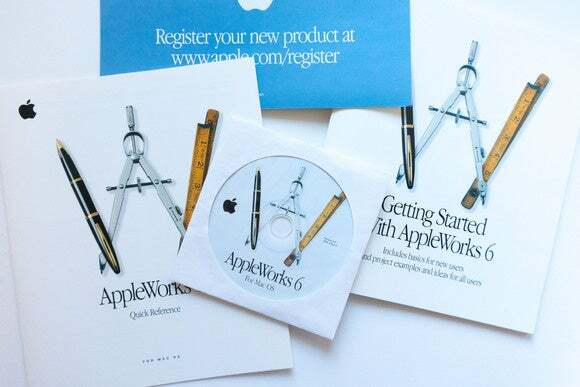 Launch AppleWorks under OS X and not only could you open the same documents as you created under Mac OS 9, but because you were literally using the same app, both the formatting of your documents and the interface of the application remained unchanged. In other words, you had one fewer excuses to dismiss OS X as a toy and reboot back into the familiarity and power of OS 9. And yet AppleWorks doesn’t stir in me the same visceral sense of excitement about the possibilities of what I could do with a Mac in anything like the same way that ClarisWorks does. It’s quite easy to explain why, too: It’s because of when I was using it and what I was doing with it. ClarisWorks for me was all about fun and exploration, about working out what my Mac could do for me, and about discovering what I was interested in as I neared the end of my school days and started thinking about further education and career. By the time I was using AppleWorks I was doing work, and the sense of limitless opportunity and playfulness had been replaced with the all-too-familiar weight of responsibility and expectation. That’s why the whole nostalgia thing is weird: It’s so personal. Those things that I have a nostalgia for, you may not, and we might only be out by a matter of a few years or even months. Indeed, tech nostalgia is weirder still, since it moves so fast and since in its early days it affected such a small percentage of the population. Nostalgia for a long-running TV show or a long-discontinued candy bar can unite a generation like no laptop or app can. And nostalgia is anyway a lie; you only remember the good stuff, deftly having chosen not to remember the bad. I peer myopically through my rose-tinted glasses and can focus my warmth and affection on ClarisWorks, but you might have just been hitting that age of delight and potential when AppleWorks came out, whether the version I’m talking about here or the original AppleWorks, which appeared on the Apple II in 1984. And I have to entertain the possibility, however strange and twisted, that there are presumably some people in the world who would go all fuzzy and happy at the mention of Office 98. I can only hope, as the author of a column entirely predicated on tech nostalgia, that there are enough people who share my experiences! 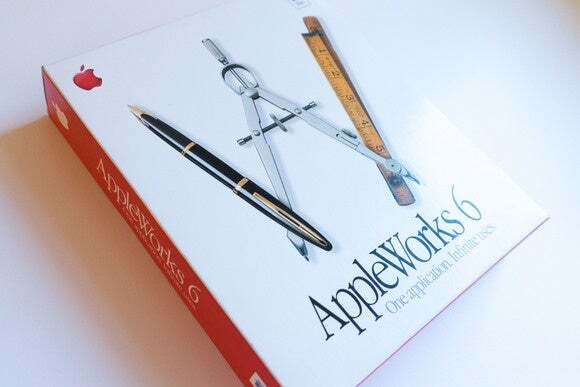 In the comments below, let us know if you have a greater sense of nostalgia for ClarisWorks or for AppleWorks, or whether you instead really pine for the glory days of Office 98. Trained operators are standing by to offer counseling.